We've discussed some of the more unique ways people are being buried these days, like custom coffins or eco-friendly burials. I am waiting for the recumbent effigy to regain popularity as well. An effigy is traditionally known as a representation of a person, and as a form of funerary art, first began appearing in the 7th century BC. It was the Etruscan Civilization of northern Italy that really excelled in portraying humans and this art evolved from just a representation of a human head, to entire figures placed on the lid of the sarcophagus. This picture on the right is taken from the Louvre. It is entitled "Sarcophagus of the Spouses" from 520-510 BC. The detail of clothing and jewelry from a time thousands of years ago is astounding, but so too is the contemporary way this person was honored in death. This art form re-emerged in the 12th century, and by the 14th century the effigies began to include hands clasped together in prayer. I find this fact interesting, considering that it was in 1415 that the Ars Moriendi text appeared as a directive from the church on how to die well, focusing on prayer for traits of faith, hope, patience, humility and generosity. 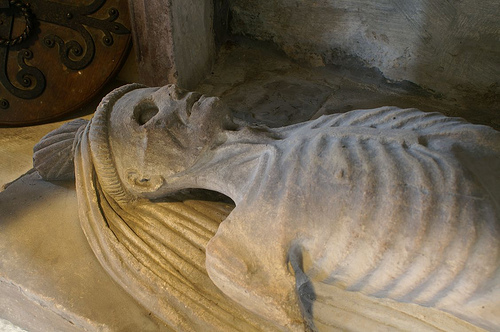 A slight variation on the recumbent effigy was seen in the later Middle Ages, depicting the effigy in the form of a decomposing corpse. Often called "transi" or "corpse tombs", the purpose was to remind the living that the "good" life was indeed temporary. 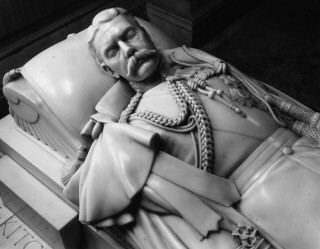 These funerary monuments often were in double-decker style, with the proper effigy on top, in robes and crowns, and the rotting corpse statue below. This picture from Fyfield in Berkshire is from Sir John Golafre who died in 1442. 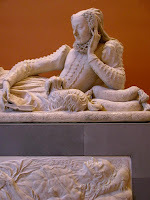 As the centuries progressed more effigies were done in life like poses, often the deceased depicted reading a book, at a banquet and often depicted in younger days. This example on the right,contained in Paris at the Louvre, is a classic example of this, as the woman appears quite comfortable reading her book with her dog near by. Notice though, the "Transi" here, with the naked decaying relief showing an older woman below the effigy. The most recent recumbent effigies I found were of Herbert Kitchner (1850-1916), pictured to the left, which is housed at St. Paul's Cathedral in London and that of Sun Yat-sen (1866-1925) in Nanjing, China. So, has this funerary art form that has existed for thousands of years finally died off? Or should we consider the embalming and preservation of such icons as Mao Tse Tung and Vladimir Lenin as modern day variations? Perhaps even postmortem photography could be considered a branch? Or what of the technique of plastination... there are plenty of rumors swirling about Zsa Zsa Gabor and Michael Jackson's bodies being plastinated. If so, this permanent effigy just may be the 21st century's answer to recumbent effigies.